‘Every Picture Tells a Story’ – SPAEDA’s off the Wall Interactive Exhibition! Release your inner child and draw all over the walls of our Big Draw interactive exhibition, it’s taking place at the Great Bow Wharf in Langport this October. We have covered the walls with plain wall paper and are encouraging everyone to grab a pencil and draw a story on the wall. Don’t worry this time you won’t get in trouble! We want the stories to reflect a change in you, your life or your surroundings. This could be something like finally growing that moustache you’ve always wanted or going up Glastonbury Tor with your pen pal Francois. Let your imagination run away with you, the possibilities are endless, reach for the stars (when I say stars I mean pencils) … and any other encouraging clichés you can think of. This exhibition ties in with Jethro Brice and Seila Fernandez Arconada’s ‘Some:when’ exhibition which is also held at the Great Bow Wharf for Somerset Art weeks. Their project revolved around the creation of a Somerset flatner, a traditional local boat used on the levels. The Great Bow Wharf will showcase the boat itself along with artwork made by children and young people in 2014 – 2015. There will also be an exhibition of photography from Gideon Mendel in the Kitchen at the Wharf. Gideon’s exhibition “Drowning World” focuses on the Somerset and Thames Valley floods of winter 2013-14; the images show landscapes vanishing under water and portraits of local residents. We are number 24 in Somerset Art Weeks as well as being part of The Big Draw 2015. The Campaign for Drawing’s annual festival The Big Draw, takes place each year in over 20 countries around the world, with 1000+ events taking place over October. This year’s Big Draw theme is “Every Drawing Tells a Story”. 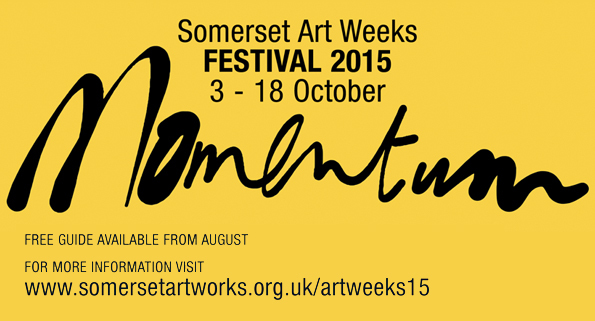 Somerset Art Weeks is an annual countywide celebration of the variety and quality of contemporary visual art that can be found in Somerset, this year’s theme is ‘Momentum’. This entry was posted in Uncategorized on September 24, 2015 by spaedablog.